What If you have troubles while watching video? 1. Adjust the volume: Go to [Settings] > [Sound & Vibration] > [Media Volume] to set the volume at max. 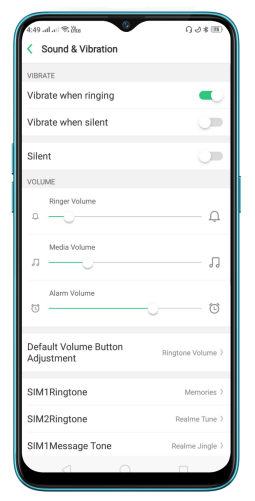 *For devices of ColorOS 5.2, go to [Settings] > [Sound and vabrition] > [Volumes] ,and then you can separately set the Ringer volume, Media Volume, and the Alarm volume to the max. 2. Switch to realme's video player when playing local videos. Go to [Files] > [Videos], select one and play it with Video. 3. Check if your phone is updated to the latest version in [Settings] > [Software Updates] or [System Updates] and update your phone to the latest version. 1. When playing online videos: Check if the network is in good condition and adjust the video's clarity. 2. When playing local videos: Switch to Realme's video player. Go to [Files] > [Videos], select one and play it with Video. 3. 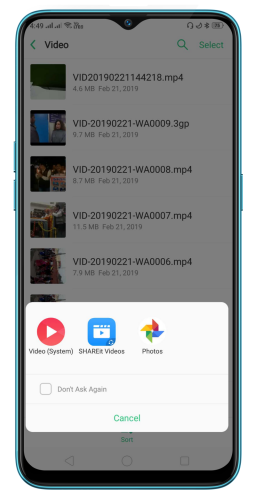 If the video file is undamaged, try to clear data and cache in [Settings] > [App management] > [All] > [Video] to check if the problem can be solved. * In some devices, you may need to go to [Settings] > [Additional Settings] > [App management] > [All] > [Video]. 1. Check if your TV can support [Wireless Display] and [Wireless Display] has been activated. 2. Make sure that the distance between your phone and TV is within 5m. 3. Check if your phone can find the device in [Settings] > [Other Wireless Connections] > [Wireless Display] and reconnect the device. 4. If your phone cannot connect to the other device, try to restart both your phone and the TV. 5. Check if your phone is updated to the latest version in [Settings] > [Software Updates] or [System Updates] and update your phone to the latest version. 6. Try with another smartphone to check if it can be connected to your TV. If other devices cannot be connected to the TV, it might be problem of the TV. Contact your vendor for more help. 1. Go to [Settings] > [App management] > [All] and find the default video player, click [Open by default] to [Clear Defaults]. * In some devices, you may need to go to [Settings] > [Additional Settings] > [App management] > [All]. 2. Go to [Files] > [Videos], select one and play it with the video player as you need. To learn more features in your phone, view realme Smartphone Manual.